Higher education officials are making the case for passing an amendment to the Texas Constitution that would allow the state to continue its low-interest student loan program. On Nov. 8, Texans will vote on 10 proposed amendments to the state Constitution, including one that would allow the Texas Higher Education Coordinating Board to continue its low-interest student loan program. With cuts to state-funded grant programs, students — particularly those in Texas — are increasingly relying on student loans. The coordinating board estimates that more than half of Texas students use them to get through college. Even among the state’s poorest students, those who are fully eligible for need-based state and federal grants, roughly 43 percent still find loans necessary to finance their education. 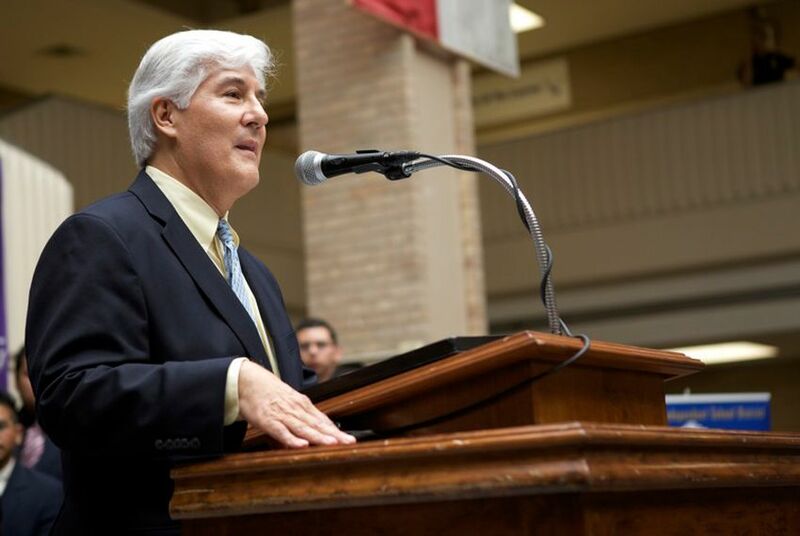 Texas Higher Education Commissioner Raymund Paredes calls approving Proposition 3 “critical to higher education in Texas.” Paredes and other higher education officials spoke to reporters about the proposal on Tuesday. The proposition would authorize the coordinating board a total bonding capacity of $1.86 billion. That’s equivalent to the cumulative total of general obligation bonds voters have approved for the program over the course of numerous elections since 1965, when the program began. Passage would also allow recently approved legislation to take effect that would increase the limit on the amount the coordinating board could loan each year from $125 million to $350 million. Coordinating board officials say they do not anticipate reaching the heightened annual limit or the total capacity in the foreseeable future, but the added flexibility of this expanded authority will provide the program more long-term stability. The last time voters reauthorized the program was in 2007. It passed with approximately 65 percent of the vote and authorized a bonding capacity of $500 million. Officials say about $275.5 million in unissued bond authorization remains, and that is expected to be exhausted by 2013. “If the program ran out of capital and there were no new loans available, significant numbers of our students would simply not be able to attend,” said Fred Slabach, president of Texas Wesleyan University, a private Methodist-affiliated university in Fort Worth. Currently, the state's main offering to students looking to borrow is known as the College Access Loan program. The loans tend to be divided evenly among public and private institutions with the average award totaling approximately $8,300. Starting this fall, the fixed rate for a College Access Loan is 5.25 percent. “This program is operated under very conservative fiscal management principles,” Paredes said. The program has been self-supporting and does not rely on any tax dollars. Officials said the program’s default rate has bucked trends by improving in recent years. Tim Summerlin, president of Schreiner University, a private Presbyterian-affiliated institution in Kerrville, said the coordinating board’s was the best-run loan program he’s found and stressed the importance of raising awareness of Proposition 3. “I suppose there’s always a concern that low voter turnout could be tilted to people who are just against anything,” he said. The darker the green, the more money that has been loaned out to students in that county.